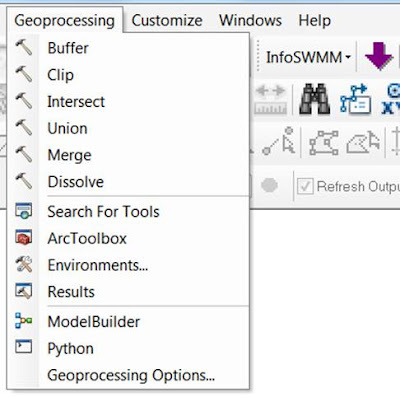 All of the SWMM5 output tables are available in the output report manager of InfoSWMM and H2OMap SWMM. A key output table is the conduit summary table where the maximum link values are shown. You can use the right mouse click to see the statistics, plot, frequency plot, histogram graph and scatter graph for the selected column. If you select two columns you can make a scatter plot. 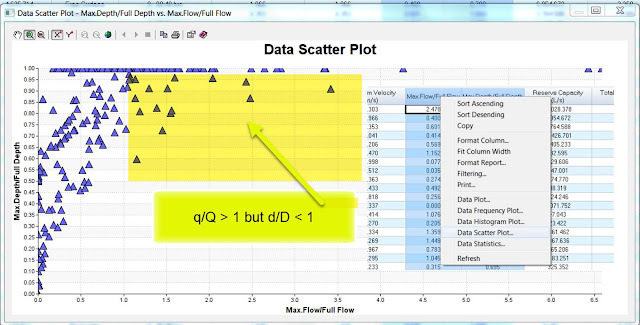 An interesting scatter graph is the d/D or capacity of the pipe versus q/Qfull for the pipe. Qfull is based on the full pipe depth, area and hydraulic radius using the bed slope. Due to the fact that InfoSWMM, SWMM5 and H2OMap SWMM use the full St. Venant solution you can have a q/Qfull greater than 1 when the d/D is less than 1. 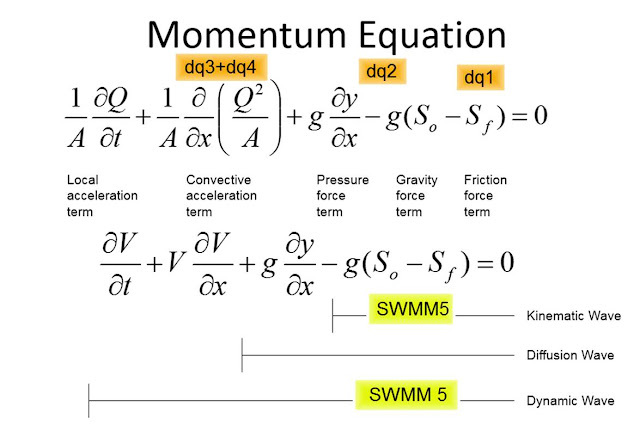 Here are some St. Venant solution in SWMM5 blogs for reference. 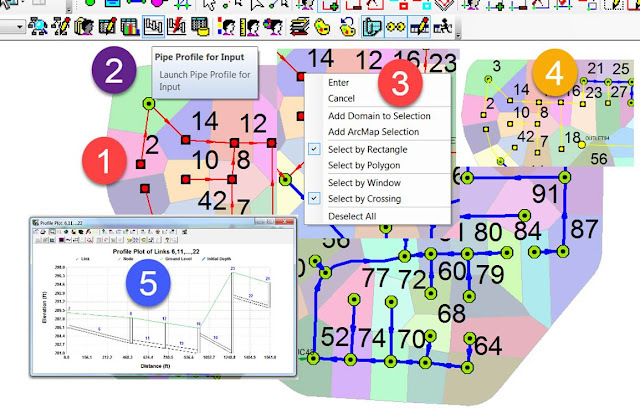 Just a note about the great work being done on the new EPANET and SWMM 5 QGIS interface. This is the third Minimum Testable Product, released for testing of specific functionality. In this blog we example the Froude Number values computed in SWMM5 as equations, table, graphs and units. 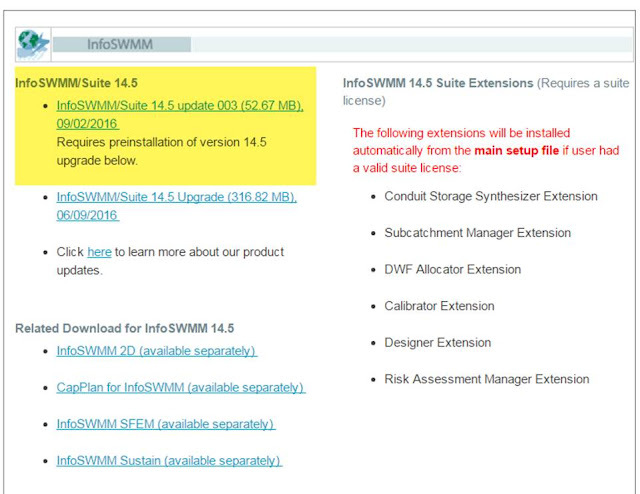 We use a QA/QC version of SWMM 5 that lists many more link, node, system and Subcatchment variables than the default SWMM 5 GUI and engine. 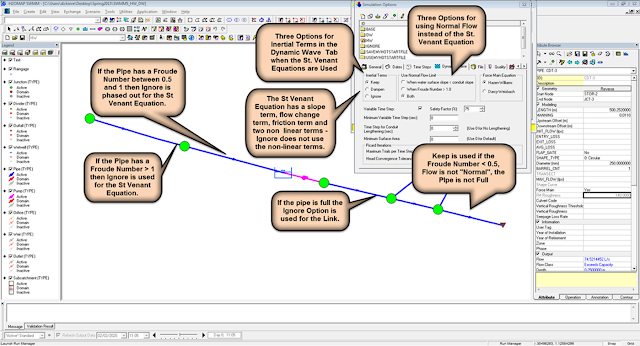 This blog also applies to #InfoSWMM and any software the uses the #SWMM5 engine. 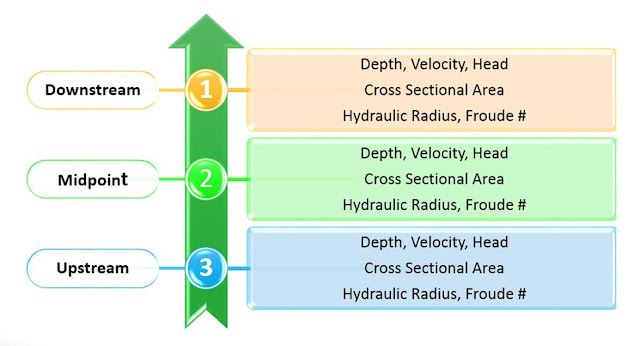 SWMM 5 computes only one flow in the middle of the link but it uses depth, head, cross sectional area and hydraulic radius at the upstream, midpoint and downstream points of the link (Figure 1). The Froude # is computed at all three points and if you could see the Froude # you will see a jump at times in a single link (Figure 2). 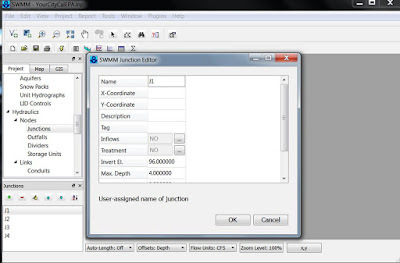 In this blog we look at GIF of how Horton Infiltration works in #SWMM5 and #InfoSWMM and any other GUI that uses the SWMM5 Engine. Innovyze President Dr. Paul F. Boulos Reelected to the American Academy of Water Resources Engineers Board of TrusteesBroomfield, Colorado, USA, October 14, 2016Innovyze, a leading global innovator of business analytics software and technologies for smart wet infrastructure, today announced that its president, chief operating officer and chief innovation officer, Paul F. Boulos, Ph.D., BCEEM, Hon.D.WRE, Dist.D.NE, Dist.M.ASCE, NAE, has been reelected for a three-year term to the Board of Trustees of the American Academy of Water Resources Engineers (AAWRE) of the American Society of Civil Engineers (ASCE). His term began October 1, 2016. He previously served as 2014 AAWRE President and on the AAWRE Board of Trustees from 2009 to 2015. SWMM5 has Topological sorting of conveyance network links in toposort.c It sorts the network for kinematic wave but also finds the degree of number of links out of a node. 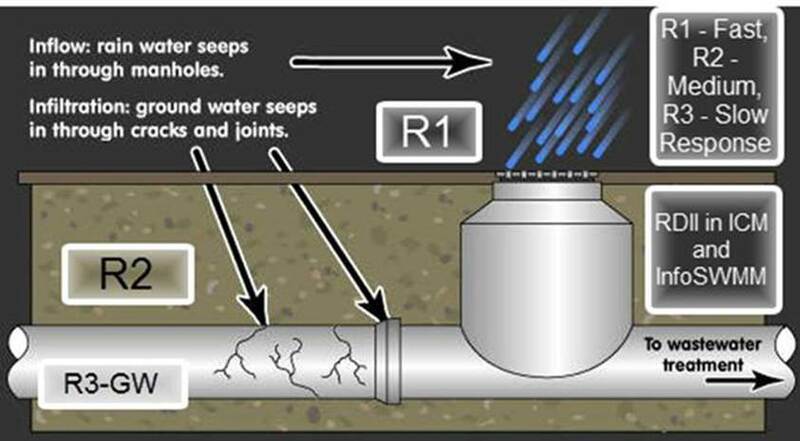 An upstream node has a negative degree and an outfall has a degree of zero. 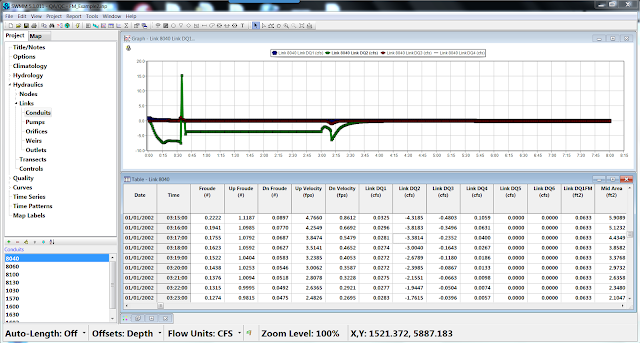 The degree of the node is used to determine the node composition for the OUTFLOWS file in SWMM 5. Figure 1 shows the node degrees for a sample network. 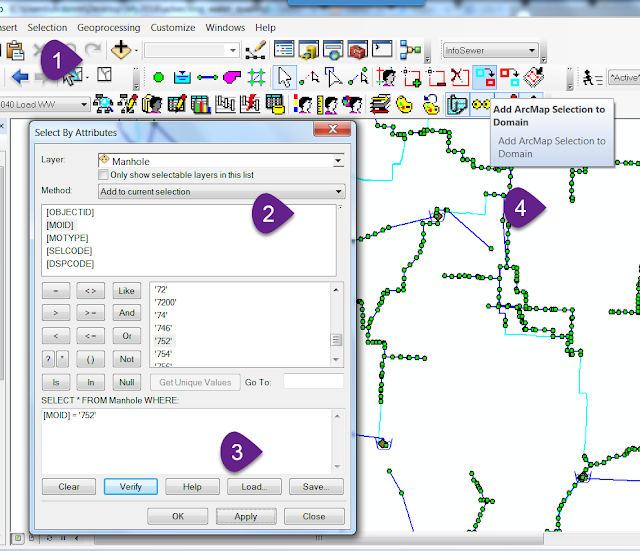 A map of how Keep, Ignore and Dampen are used in #INFOSWMM and #SWMM5. The Keep, Ignore and Dampen opens are important it the engine for controlling which St. Venant terms are used. 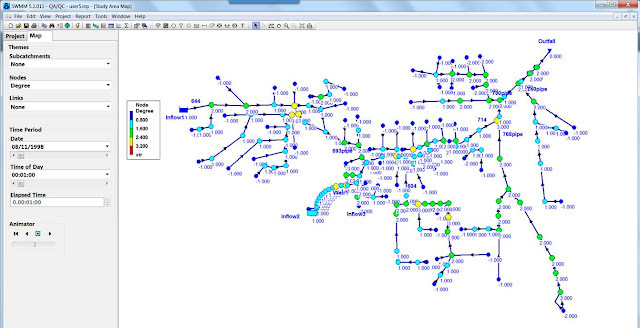 The d/D is the middle value and is the average of the depths at the upstream and downstream points of the link. CDT-2249 has a d/D of 0.47 as it does not have a downstream effect.